During a survey in Lohrati village, Barmer (Rajasthan), Soochna Seva team met Rajaram. He is 35 years old, married and has 3 kids. 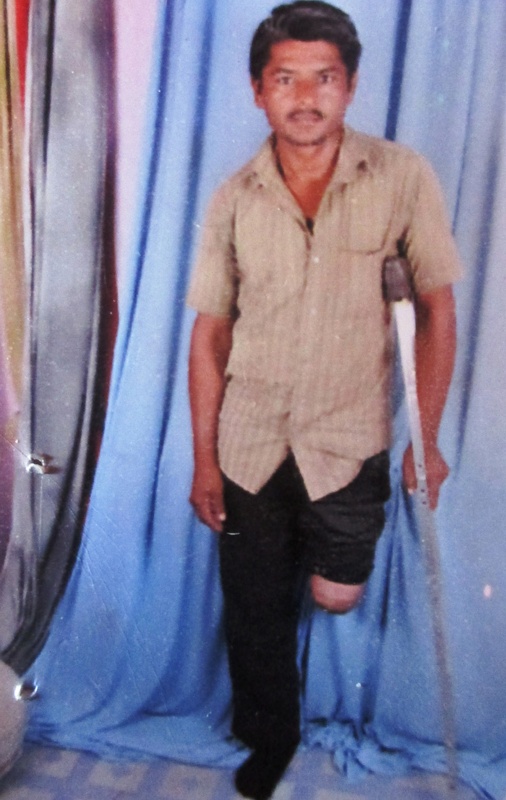 Two years ago, in an unfortunate accident, Rajaram lost his one leg. The accident not just crippled him but left his whole family shattered as he was the only breadwinner for them. In the event of finding no employment, the family financial situation went so grim that soon affording medical expenses of Rajaram became impossible. The Soochna Seva team helped Rajaram family by informing them about various government schemes which can provide them some financial relief. The team decided to apply foe Rajaram under the disabled section. For that, the team first priority was to get his disability certificate made as soon as possible. After obtaining the certificate, the team on behalf Rajaram applied for the state scheme for Disabled. Today, Rajaram receives monthly Rs 500 grant to support his household expenses. The pension amount is still very meagre so SSK team is preparing to apply for Paalanhaar Yojna to provide more support to the family. As and when the pension will start under Paalanhaar, the family will receive Rs 1000 per child to pursue their education. This will be a real help for the family to ensure a better future.